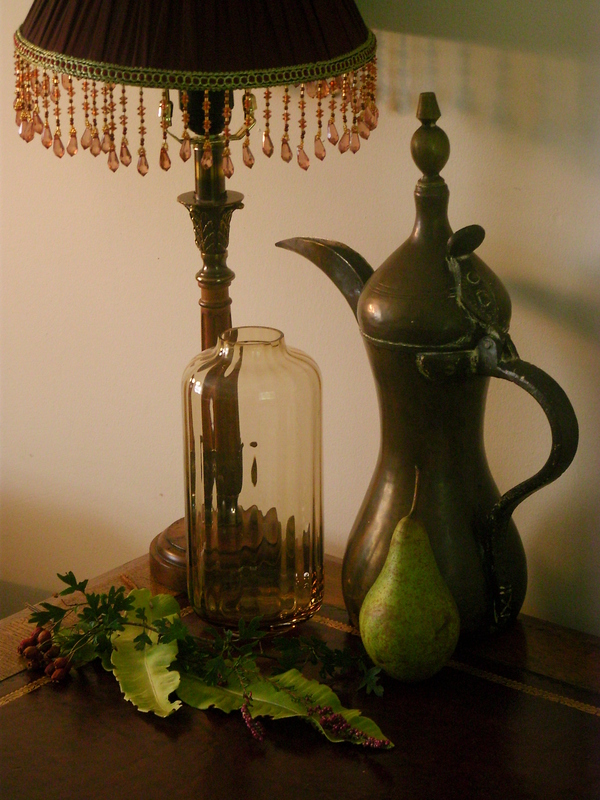 Still life in tone using colour. 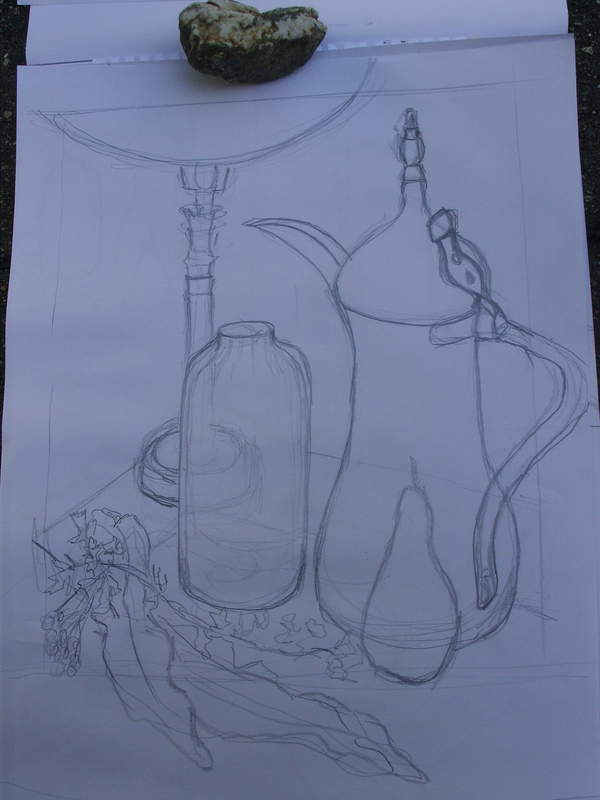 I did some preliminary sketches to get used to the materials and ideas. 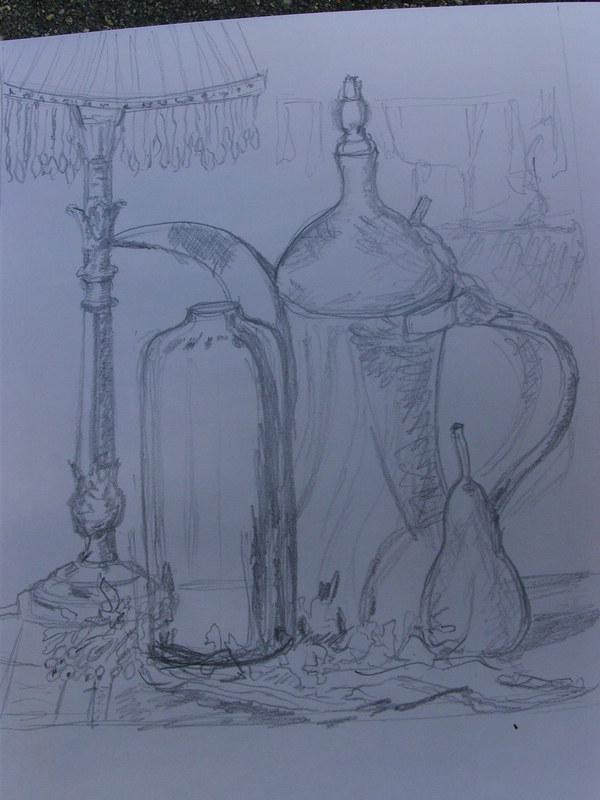 Sketch for coloured tonal study. Pastels. Sketch for coloured tonal study. Coloured pencils. 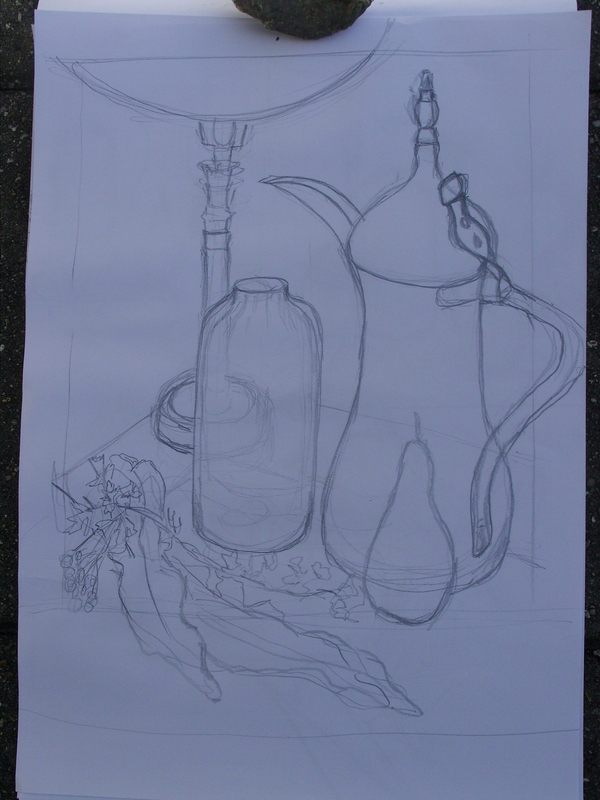 This exercise was a difficult one, using colour “quickly” and trying not to make outlines of the objects. I took a long time to decide on my objects, and arranged them with a strong light on one side and sunlight coming from the same side. this created some interesting reflections, which I hoped to capture. 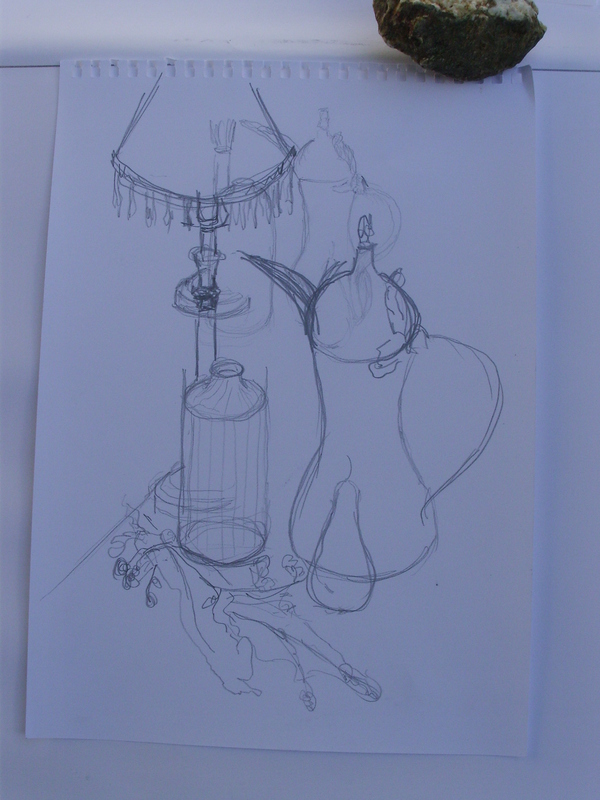 I think the composition was rather ambitious, especially including the glass vase with fluting. 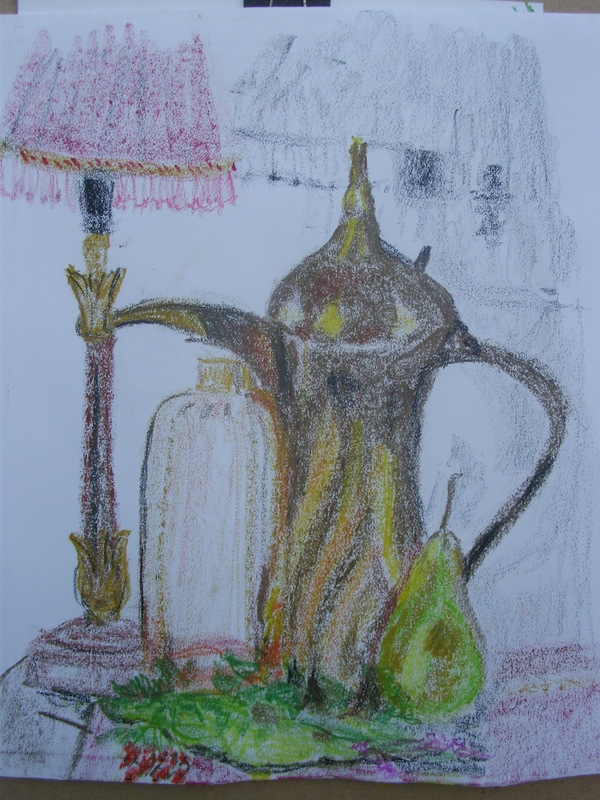 I liked the colours, the dull brass of the Saudi tea pot, and the brownish-apricot of the fluted vase, but again, I was not confident that I would be able to match them using the materials I have available. I made several warm-up sketches. I find it very difficult to sketch small, so they were all quite large. I was standing and looking down onto the composition, and the tea pot was at a difficult angle. I struggled with the shapes and positioning. Then I moved position, and sat with the arrangement almost on my eyeline and the teapot side-on. 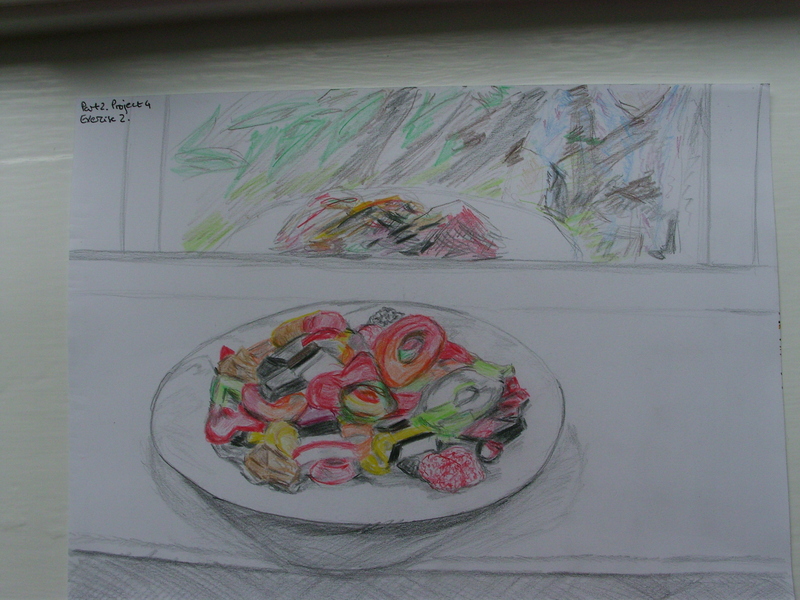 This created negative spaces which made the drawing of the shapes much easier. 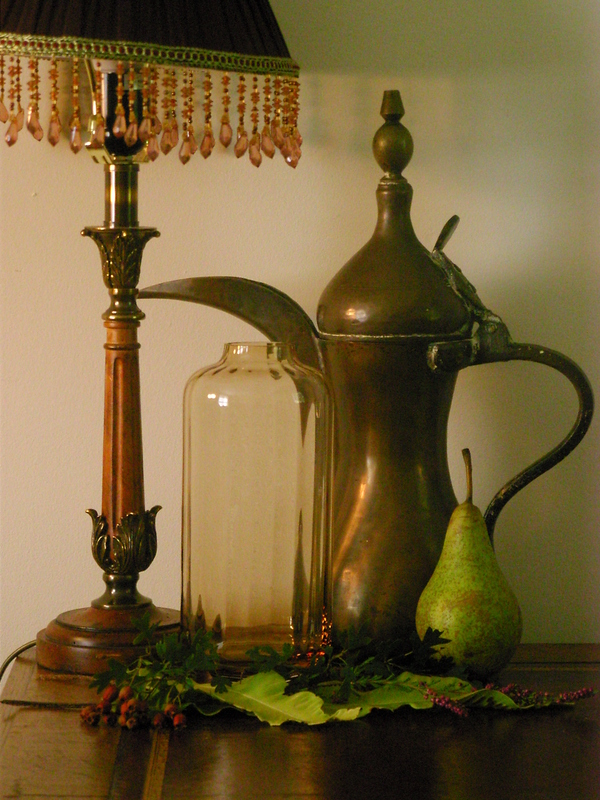 Still life arrangement 2. Exercise 2 Still life in tone using colour. 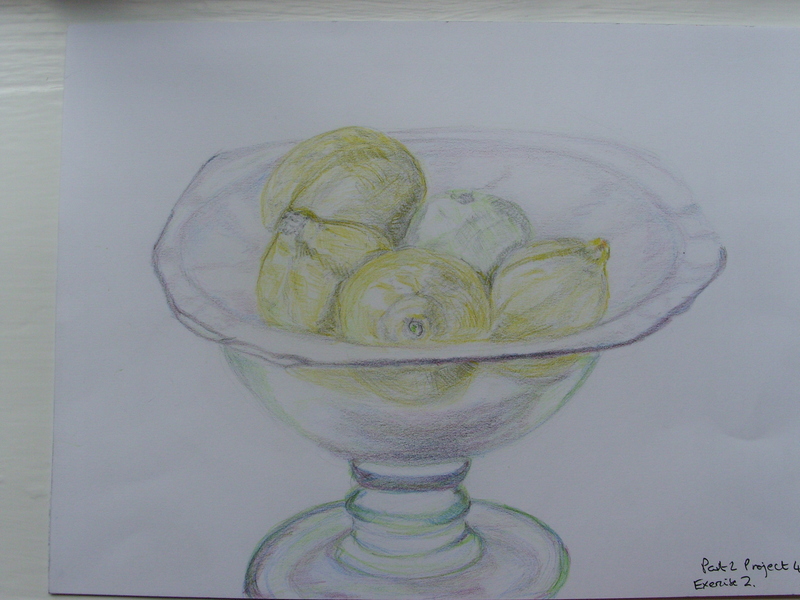 Part 2 Project 4 Exercise 2 Still life in tone using colour. Hard pastel on Fabriano paper. 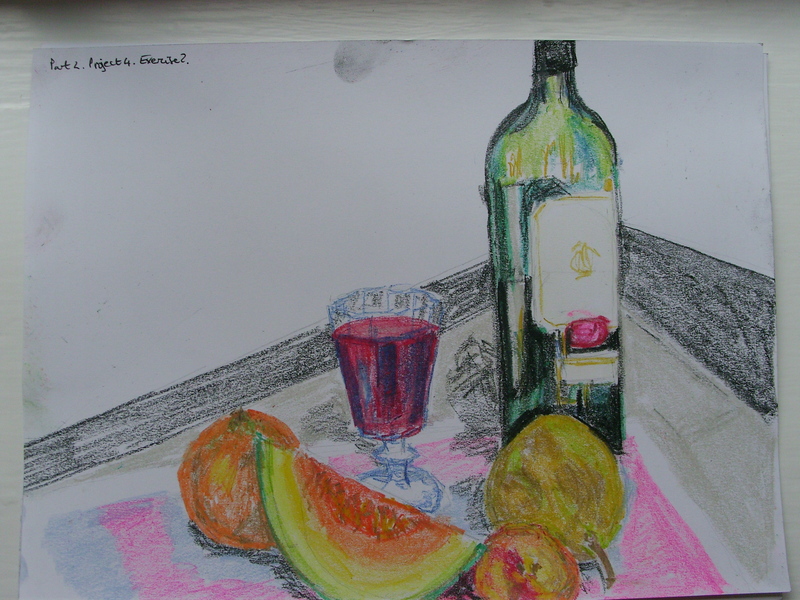 Part 2 Project 4 Exercise 2 Still life in tone using colour. Hard pastel on acrylic paper. This took at least an hour and a quarter. I have already commented on some of these points eg Point 1, What aspects of each drawing were successful and what did you have problems with. 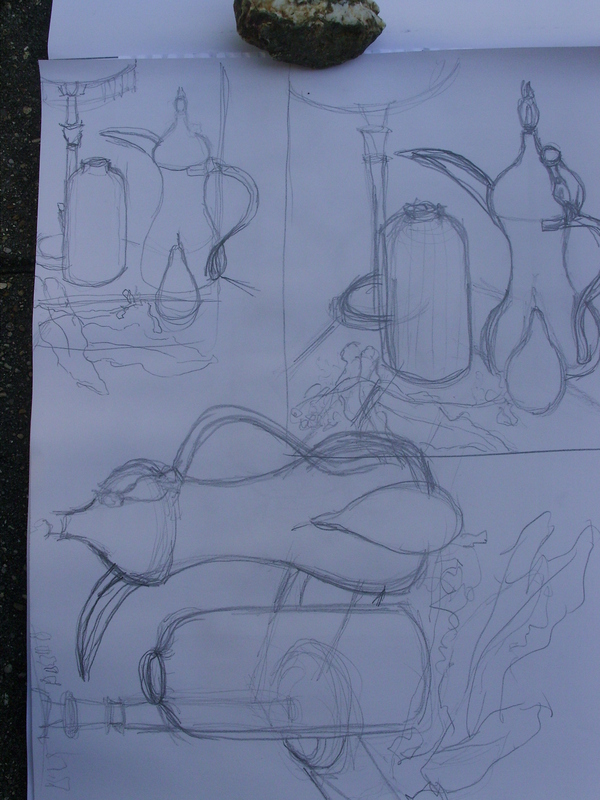 There is more depth achieved in the second exercise than the first, I think because of the strong sunlight and the fact that I was looking down more on the arrangement in the first. I have made more effort with background in the second, including trying to give a sense of the shadow thrown on the wall behind the objects. It was difficult for me to get depth using coloured media, and I think that I shouldn’t have used black, especially the dark black line on the foot of the lamp. 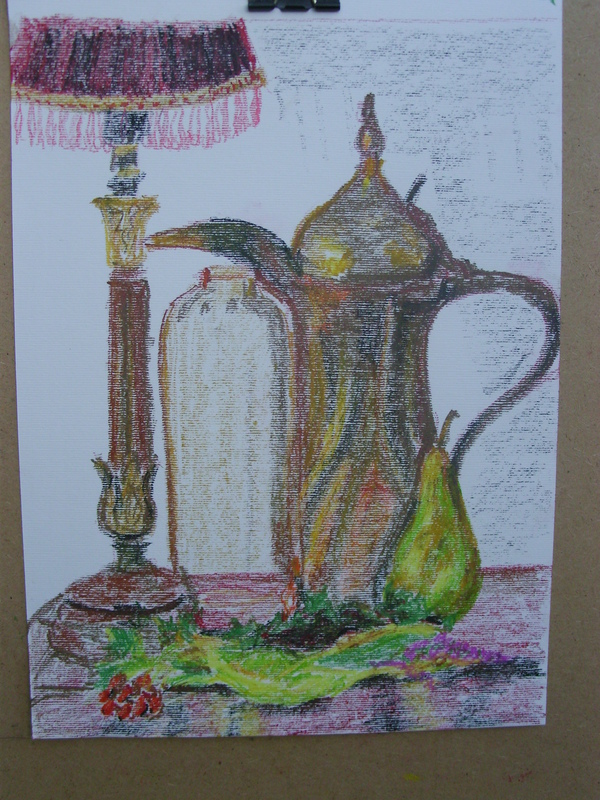 I am not sure that I have successfully exploited the potential of blending (if there is potential with hard pastels). I used two different types of paper to see if it made a difference. I am happier with the results on the acrylic paper, but it took much longer to complete.